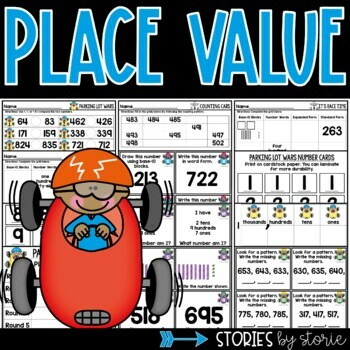 If your second graders are working on place value, take a look at these centers and games. 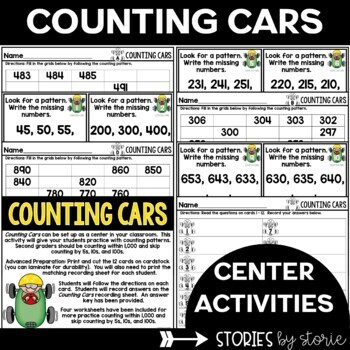 Students will practice reading, writing, counting, and comparing numbers in a variety of ways. Many of these activities include task cards which are a great way to get your students up and moving during math! There are also four skip counting practice pages included in this section of the pack. There are also two worksheets included in this section for additional practice or seat work. Parking Lot Wars (2.NBT.4) - this activity is a game for 2 players. Students use provided number cards to create the largest number possible. However, only one card can be drawn and placed at a time. Once a card is placed, it cannot be moved. There are three different versions of the game board included (2-digit, 3-digit, and 4-digit). Students will compare the numbers they create for five rounds. 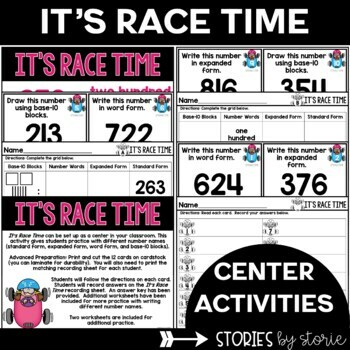 There is also one additional practice page for comparing numbers in this section of the pack. 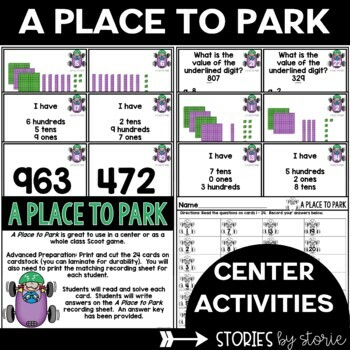 These math centers are aligned with the Common Core Numbers & Operations in Base-10 Standards. Please take a look at the preview to get a better idea of what is included in the pack.